Not everyone is familiar with Orange Wine; it is a type of wine which dates back centuries and its origins can be traced to Armenia, Georgia and Iran. It made a comeback in the eighties and nineties in the Friuli region and is now also produced by COS in Sicily. Orange wine is a white wine made from white grapes but in the way that red wine is made. The normally discarded grape skins and seeds are introduced back into the juice and vinified in amphorae with a long maceration (anything from 4 days to over one year). There is very little intervention on the part of the wine maker. Extended skin contact gives the wine an amber to deep orange hue, in fact this type of wine is also known as 'amber' wine or 'ramato' in Italian. So what about the taste? Orange wine certainly tastes different to normal white wine, it is soft and understated and intense at the same time. It has a similar texture to red wines with tannin, depth of flavour and more texture. 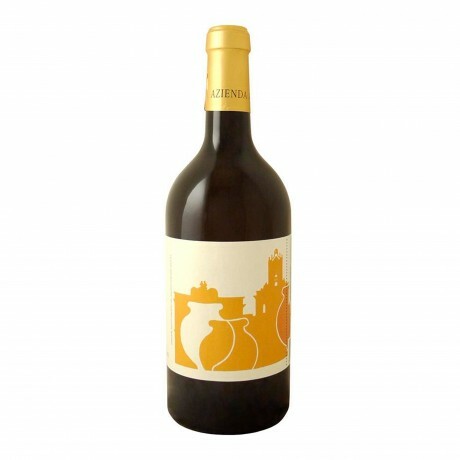 Pithos Bianco is made from 100% Grecanico grapes. The palate is complex, nutty & spicy with savoury, mineral notes. This is a powerful and broad wine with hints of peach, dried apricot, spice and nut flavours. Serve slightly chilled, as an aperitivo wine (it is fairly low in alcohol) or to accompany a wide range of foods including curry dishes, Moroccan, Ethiopian, Korean, Japanese cuisine. Excellent with pasta dishes, risotto wiith seafood, a variety of meats and grilled fish.